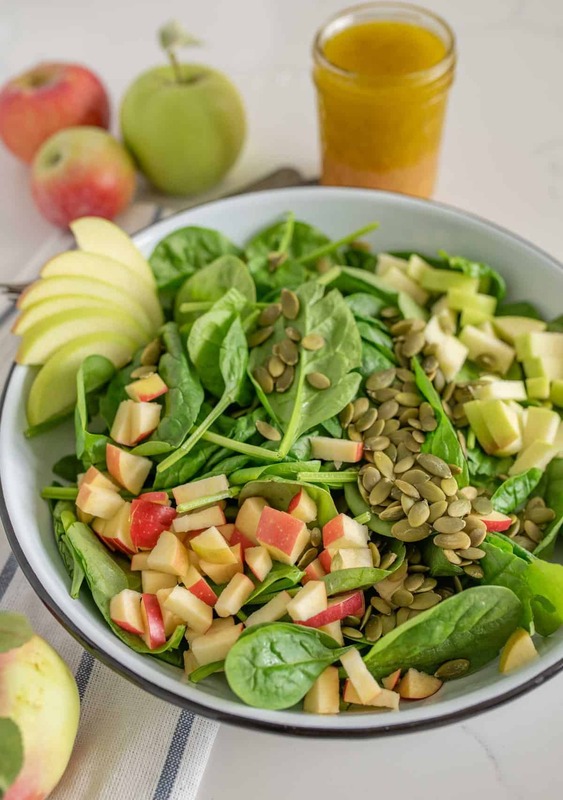 Quick and easy spinach salad recipe with apples, pumpkin seeds, and a simple flavor-filled apple vinaigrette dressing to go with it. 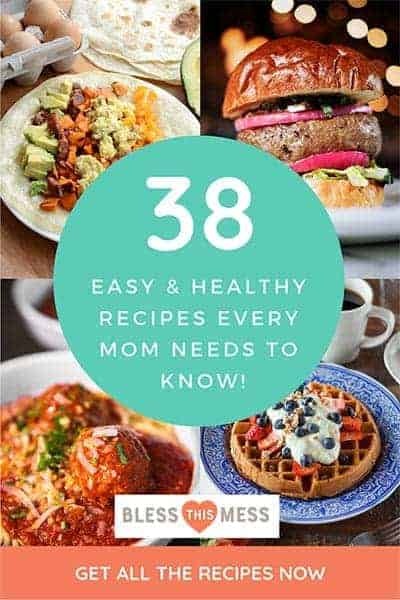 I love finding quick, easy, healthy side dishes because sometimes I get a roast in the slow cooker or some chicken legs in the oven and then I get tired of thinking about dinner. 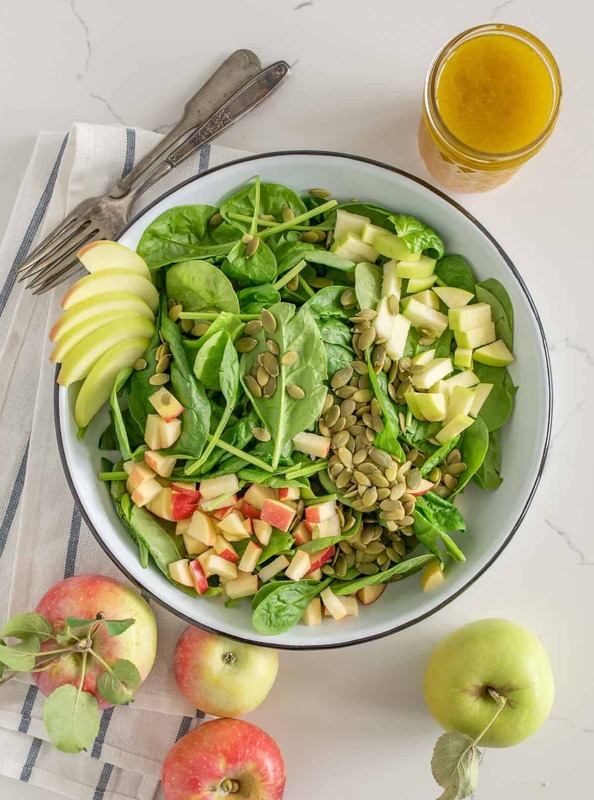 Apple Spinach Salad is one of those quick, healthy, easy recipes that you can pretty much keep everything on hand for because it doesn’t have a whole lot of ingredients and it always tastes great. 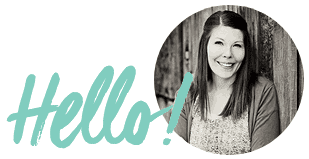 It’s a really simple recipe to swap out what you love or have on hand too. No pepitas? Great, use sunflower seeds or cashews. No fresh apples? Great, try seasonal peaches or strawberries. It’s so flexible and always delicious. The start of a really simple salad, in my opinion, is a great salad dressing to go with it. 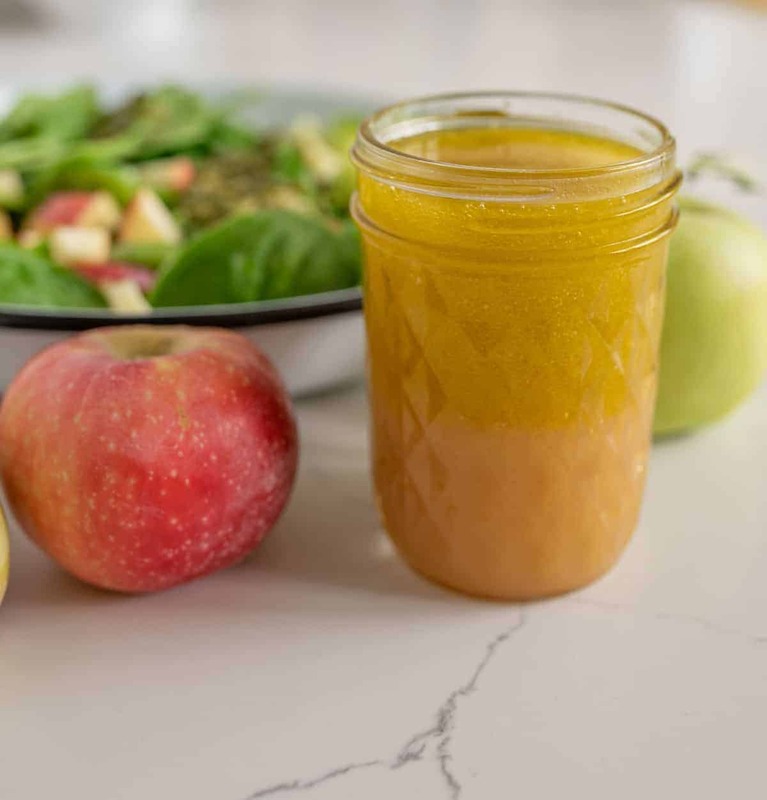 You are going to love this apple vinaigrette! 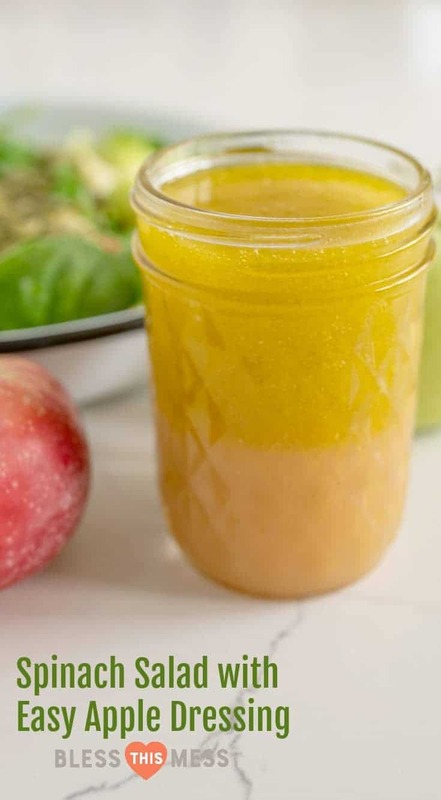 I tried a few different things to get an apple flavor into it and in the end, using apple juice concentrate made the best dressing with the most flavor. It’s just sweet enough (without being a sweet dressing really) and it’s packed with apple flavor. Add in some basic seasoning, apple cider vinegar, and a good quality olive oil and you have yourself one really easy but very impressive dressing. 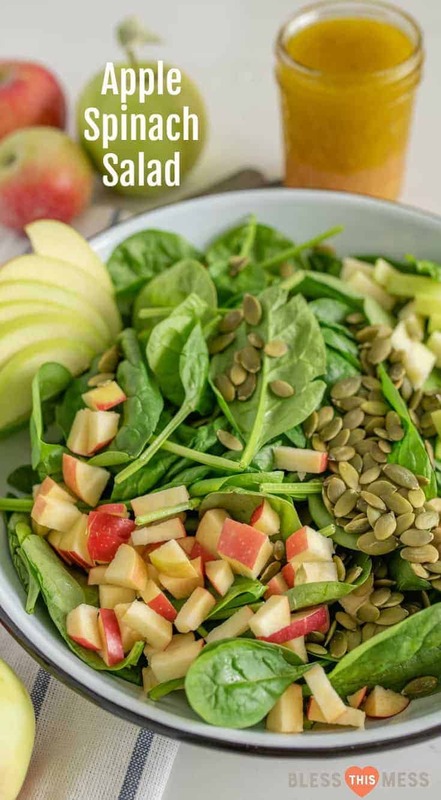 Add this easy salad to your meal plan this week because you can’t beat fresh apples this time of year! Baby spinach is one of my favorite greens to work with because it’s prewashed, it’s tender, not bitter, and it’s easy to find. I’ll often give the bagged baby spinach a rough chop when making salad for my family. It’s a bit easier for little mouths to chew that way. 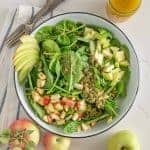 If you are prepping this salad ahead of time you might want to toss the sliced apples in just a little lemon juice so that they don’t brown before serving. The beauty of this salad is that you can add a whole lot of things that you like or have on hand – it’ll be delicious. You can also just stick with salad, apples, and a few nuts or seeds and it’s still delicious. Make it your own or keep it simple, it’ll be good either way. To make the salad: place the spinach in the bottom of a serving dish. Chop the apples into bite-sized pieces and place on top of spinach. Add pepitas and other nuts as you like. Add optional ingredients. To make the dressing: Add all of the ingredients to a pint Mason jar, add the lid, and shake well to combine. Adjust to meet your taste. Add a few tablespoons of the dressing to the salad and toss to combine. Serve the salad with additional dressing on the side so that people can add more as they like during the meal. Long live all the super easy side dishes that are packed with nutrients, easy to make, and taste like something you’d get at a restaurant! Happy cooking from my kitchen to yours friends! My guess was cider. It is a scrumptious salad! I added grilled chicken for the meal. Thanks! Yessssss! Add a little protein and call it a meal!